I often work with clients who are seeking the help of a professional interior designer or redesigner because they have become frustrated trying to find a way to accommodate all of their lifestyle needs within their homes. Some are couples wrestling with space issues in newly merged households, but many are singles or families who have yet to figure out how to live comfortably in homes they have occupied for years. What I've found intriguing about this problem is that it rarely relates to whether the home is commodious or small. More often than not, the source of the problem is not how large the space is, but rather how the space has been utilized. 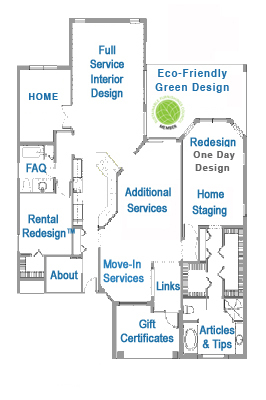 And, the culprit is a most unlikely suspect - our traditional notions about floor plans. The Disney Company hires "imagineers" - people charged with imagining and then creating innovative entertainment. I've always loved the concept, because it's based on the assumption that something new and wonderful can be created if you free yourself from pre-conceived notions and are willing to walk into uncharted territory. It's the same thing in your home. If you throw out pre-conceived notions about how you should live based on floor plans developed by someone whom you have never met and, therefore, couldn't possibly know anything about your lifestyle, and step back to re-imagine your space as if you were the first person to ever encounter its walls, you will free yourself to create a home that's far more in tune with your needs. One of my clients, a recent retiree, moved back to the city after years in suburbia. He found a lovely two bedroom apartment, a spacious unit by anyone's standards, with ample closet space, a large dining area off the entry, and a 12 x 12 breakfast room situated between the eat-in kitchen and a living room with a view that went on for miles. Yet, after only three months, he was convinced that the apartment was a terrible mistake. He just couldn't figure out how to accommodate both the formal living room he enjoyed for entertaining and his more casual, former family room furnishings - a leather love seat, his favorite club chair and a big screen TV - in the same living area. When I met with him, he showed me photo after photo of furniture arrangements he had tried in the living room. And, indeed, from the evidence, it certainly looked like he had tested every imaginable configuration. What he had not tried was re-imagining his floor plan. The plan said "Dining Room," so the area off his entry was furnished as a dining room. Because the floor plan indicated "Breakfast Room," he had gone out and purchased another, less formal dining set for this area. And, oh yes, a banquette and table were dutifully installed where the plan indicated it should be in the eat-in kitchen. While his design instincts were right when it came to maintaining a cohesive look for his living room, he was at a dead end because it never occurred to him to deviate from the floor plan that had been handed to him by the rental agent. He had utilized the space per the floor plan - one living area and three dining areas - despite the fact that he confessed to rarely using any of the dining areas. He much preferred his morning coffee and informal lunches "bachelor style" in front of the TV and, generally, went out in the evenings. It was a simple and painless solution to create a den for his former family room furnishings in the area that had been earmarked on the plan as a breakfast room. The den allowed him to reserve his living room for more formal entertaining and adjoined the kitchen, making breakfast in front of the morning news convenient as well as comfortable. But it was a solution that had never occurred to him because it necessitated taking a giant step back in the design process and re-imagining the floor plan. What I've learned from my many clients over the years is that not every home needs a dining room, let alone three, or even a living room. An eat-in kitchen isn't always the asset it's claimed to be in the rental market. In some homes, a cherished nook for quiet time is more valuable than a walk-in closet. In others, there are cooks who would gladly give up the master suite to realize their dreams of a chef's paradise. We are all different, living lives that uniquely suit each of us. So why do our homes need to be so similar? If you want a fresh take on a home that's not quite living up to your lifestyle needs, don't start attacking the problem by dragging the furniture around the room. Instead, step back, close your eyes, and become an imagineer.